The following list was from Club Solutions magazine, detailing the Top 10 Trends in the fitness industry for the next year. I'll list them, then offer a bit of my own thoughts on each. Wearable technology. This includes activity trackers, smart watches, heart rate monitors, GPS tracking devices and smart eye glasses. According to ACSM, “some business analysts have predicted that sales of the Apple iWatch alone will exceed 485 million devices by the year 2018.” - Coach Rick Says: I use mainly GPS watches for my running and cycling. I have used step counters but found them to be not so helpful. My body feels it on days with a lot of steps and I really don't need a watch to track that...I feel it enough. I guess it could help in overall activity volume for a week as a good measurement tool, but I track enough of that anyway with my distances on the bike or on runs, and frequencies of strength workouts. Bodyweight training. Although bodyweight training has been in existence for some time, ACMS explained “new packaging, particularly by commercial clubs, has made it popular in gyms and health clubs around the world.” - Coach Rick Says: You can get a lot of Bodyweight exercises that are sensible and manageable to do with HWR. High-intensity interval training. ACSM stated, “Despite the warnings by some health and fitness professionals of the potential for increased injury rates when using HIIT, this form of exercise has become popular in gyms all over the world.” - Coach Rick Says: Been doing HIIT style exercise for many years, nothing new to me, but it offers a great variety of choices versus just picking a distance to travel on a bike, treadmill, or cross-trainer. "Speed" workouts for running are HIIT without being called that. I get plenty of this effort with running speed workouts. Educated, certified and experienced fitness professionals. ACSM explained there are more “third-party accreditations offered by national accrediting organizations for health and fitness and clinical exercise program professionals, and a registry designed for exercise professionals.” In addition, the standard for fitness professionals is now higher than ever. - Coach Rick Says: experienced professionals are a great resource, but don't forget the new ones out there, too. They need the experience to get over to the "experienced" status. Strength training. “Many contemporary and innovative health and fitness professionals incorporate some form of strength training into the comprehensive exercise routine for their clients and for their patients,” according to ACSM’s survey report. - Coach Rick Says: This one is just an essential. Strength is the foundation for everything else. If you don't strengthen your bones and muscles, you're placing undue stress over time on your body. This shouldn't be just a 'trend', but a necessity. Group training. Although group training has made the list as a top trend before, this is the first year the exercise has ranked so high. - Coach Rick Says: Group Training is a fun activity to do with friends and also meet new ones. The built in support system helps people stick with exercise programs. Just be careful of the group exercise programs you choose, some can not be ideal for some people if they are too high-impact (i.e. a lot of jumping exercises) for you. Exercise is Medicine. According to ACSM, “Exercise is Medicine is a global health initiative that is focused on encouraging primary care physicians and other health care providers to include physical activity when designing treatment plans for patients and referring their patients to exercise professionals.” It has recently gained traction, and ACSM speculates will continue to do so. - Coach Rick Says: More medical professionals should incorporate exercise plans, in my opinion. Just an improvement in cardiovascular health and overall strength can lower blood pressure and cholesterol levels greatly in a matter of a few short months. I've had seniors go off of medications once they stuck with a solid exercise plan. The medical field needs to partner more with fitness professionals on this. Yoga. ACSM explained yoga remains a top trend “due to the fact that it is reinvented and refreshed every year, making it an attractive form of exercise.” - Coach Rick Says: I've never been a big fan of Yoga, but it can blend into an overall exercise regimen. I don't see it as all-or-none solution though. Personal training. ACSM said personal training continues to be a top trend, stating, “Since this survey was first published in 2006, personal training has been in the top 10 of this survey …. Much attention has recently been paid to the education (through third party accreditation of CAAHEP) and certification (through third party accreditation by NCCA) of personal trainers.” - Coach Rick Says: Trainers can be helpful, for sure, as I was once a trainer in the field for a number of years. However, not everyone has the time or can afford them either. Online assistance can be a much more affordable option and another avenue for trainers to continue their efforts in helping people out. Many people will get online personal training, even through video feeds today. Exercise and weight loss. According to ACSM, “Exercise in circumscribed weight loss programs has been a top 20 trend since the survey began. In 2014, this trend was ranked no. 6, where it remained for 2015, and was no. 9 in the 2016 survey. The combination of exercise and weight loss emphasizes caloric restriction with a sensible exercise program.” - Coach Rick Says: Not everyone exercises to lose weight, but for many people, that is the initial reason to start exercising. Exercise can compliment a weight loss strategy very well, especially in conjunction with a well rounded dietary plan to follow. Overall, these trends are prevalent in the fitness industry as a whole and most of these fluctuate in popularity, year by year. Many have been around for years, and most likely will stick around for years to come. Perhaps one of these trends will open up a new door for you with your fitness goals! I started today off with a 16 minute HWR workout of a majority of bodyweight exercises, with the lone exception of doing some dumbbell curls as the finish. It was a mix of jumping jacks, bodyweight squats, push-ups, lunges, Spider-Man climbs, and TRX Rows (bodyweight rows on straps, but I subbed in the curls since I don't have a place for straps in my workout area). I thought of riding the bike last night, but like what other people go through, you have a down spell now and then and you have a tough time fighting through it. I've been there, I know what it is like. This past year since June, I've had a lot of down spells. Suffering through the loss of my wife has been very difficult some days. I've used exercise to get me through some spells, but other times, exercise just doesn't feel like the right answer. Maybe it was easier when it was nice outside and an evening bike ride was the right recipe for it. Now my option is either a really cold bike ride on the fat bike, or the indoor bike and Netflix. However, I do feel exercise, at any level, is great in the mornings to do, for someone like me who battles these feelings. A morning workout will at least give me a physical and mental boost for the day and help get me started on a good note for the rest of it. I know this may not be ideal with others, since they may not be 'a morning person', as they say. There is nothing wrong with evening workouts if that works better for you. One key advantage I see with morning workouts is that it hardly changes. Usually, each morning is generally the same for people. You wake up, you prepare for the day, go to work, and then evening times could be jumbled around. You may have a ball game to go to, or a kid's concert or sports practice to pick them up. Maybe you have to help a neighbor with something. Maybe something in your house needs 3 hours of attention. You just never know what may come up later in the day that changes plans for the night. That's why I think morning routines tend to fit better and stick better with most people who try them. Generally, when I did my own fitness training business, my morning attendance of clients was higher it seemed, compared to after-work appointments. Why? Because most cancellations would start with 'something came up'. I'm not trying to tell you when to workout, but I'm just telling you what I've experienced. Last night, I got on the indoor bike and clipped a good 7 miles on it, doing some Tabata style intervals for a portion of it. My first mile was good, until my seat let loose and I had to take a few minutes to fix that. Once that was set in place better, I ended up going for 5 minutes easy, then 5 minutes Tabata style, then 5 minutes easy and finishing out the ride going at a faster clip for the last 2 or so minutes. This morning was another kettlebell clean workout with the 53# kettlebell. Kept up with my regular interval of 20 every 90 seconds, doing that for 100 reps, then trying to do 40 at once, resting until the 3 minute point, doing 20 for a set, then finishing off with 40 straight again. The last 40, I switched hands every 5 reps and that went smoother than 10 straight on each arm. As a fun thing to do last night, I made a short 10 minute video on Facebook Live, going over some basics of "Where Do I Start?" when it comes to a fitness program. I thought I'd go for 5 minutes or so, ended up being 10. Take a look here on the ASAP Workouts Facebook page for the video. I cover some basics of strength training frequency, cardio workout frequency, and types of exercises to do when it comes to strength training. Think in terms of movements, not just muscles alone. Like I highlight in the video, the HWR series is a good, all-around program to buy if you are looking for something to follow and use as a solution. I explain why HWR is a great choice when it comes to strength training your body and using its series of workouts as a part of your plan. It was a hard time waking up this morning, maybe it was due to sleeping in pretty consistently the past few days. Anyway, my body was pretty sore from the combo of snow removal and then the KB workout right after that. I opted for a 10 minute HWR routine, which was 5 exercises to target some twisting, pushing, lunging and squatting actions. It was twist, push, lunge, twist, and squat in that order for 2 minutes, 4 rounds of 20/10 each 2 minute round. I'm bound to get back on my bike again, the indoor one, and I'm setting aside time tonight for doing that. I need to get back to riding again, I've been taking too long of a break and I need to add that to my overall plan in January. I'm also planning to do the diet routine from The Achievable Body program. TAB has a great diet program that is simple to follow and whole foods-based. It also blends in well with shakes to be a snack or meal. Some programs will have you drink shake after shake, this one is mainly a diet that uses them as compliments, not dominant control over your diet. It's a short and sweet one, so take the extra time today to consider the 24 Day Challenge! My personal 24 Day Challenge Group is still taking people on Facebook, join it today. This weekend, I was stuck at home due to an impending ice storm and blizzard that hit us on Christmas and is lingering a bit today yet. I didn't travel anywhere for it, so I had ample time to relax, watch some TV shows I've been meaning to watch on Netflix, and also workout a bit. I took Saturday off as a recovery day, I actually had 14 straight days of workouts and my body needed it. Sunday I ended up doing a 19 minute HWR workout in the evening, adding some dumbbells on some exercises to add a bit extra to the routine. This morning's routine was out in the driveway to start, shoveling for about 15 minutes or so to get rid of the first batch. The wind is still blowing things around and I'll probably have to shovel again, just not so much this next time. After the shoveling, I ended up doing a kettlebell clean workout of 10 per side, 20 in a set, every 90 seconds on the way up to 15 minutes. 10 sets of that equals 200 cleans total with the 53# kettlebell. I also got some new reading material that is some pretty classic stuff. 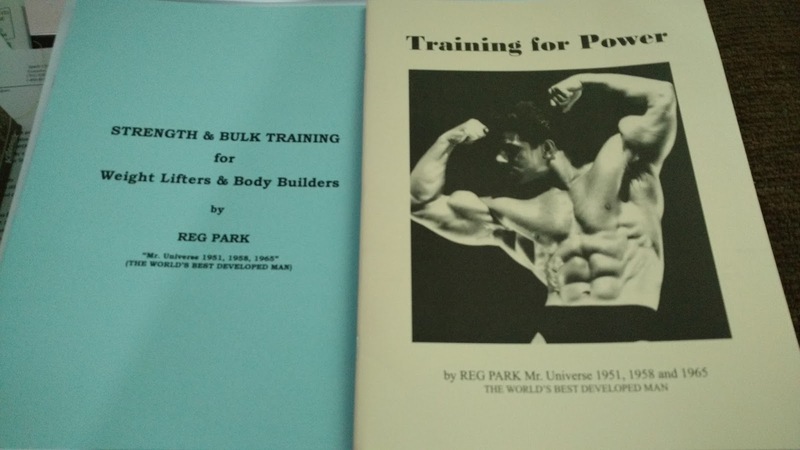 They are two books by Reg Park, a famous bodybuilder and actor from the 50's and 60's. 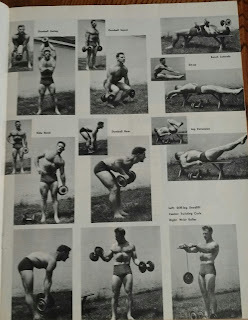 The origins of the "5x5" plan are in the "Strength & Bulk Training" book, and part of the reason I got it was for the historical perspective of it. "Training for Power" is also another compliment to this book and worth adding to my collection. I am a history nut and books like this really intrigue me. The roots of many current programs and programming are said to come from this author, so that alone really struck my interest. I haven't read through both yet, but got started on the Strength & Bulk Training one on Sunday night. They are pretty short reads, so I ought to finish both today. These were both 'mail order' guides from years ago and are still in reprints today from http://superstrengthtraining.com. This site is full of historical training guides and worth a look! Have you considered what you'll be doing in January yet? The 24 Day Challenge is still there to take, and ordering early this week should get it to you by the end of the week. The free shipping offer ran out on December 20th, but you can still get a great deal and also get the free gifts too if you order this week. Not sure about that entire package? Might I suggest doing this combination: a box of Spark with a box of the MNS series. This may be more affordable for you and still allow you to get some quality products from AdvoCare to use. The MNS packs are pretty simple to use, they even tell you when to take them. Even 2 boxes of MNS would get you through 4 weeks of effort. Check out all these options at http://tinyurl.com/asapadvo and be sure to ask me anything about the products if you want more assistance. Don't forget to join the 24 Day Challenge Group I've setup on Facebook too, it is free for everyone to do, regardless if you are taking AdvoCare products or not. I've been a long-time, workout-at-home type of guy, even when I worked IN the gym as a trainer. Yes, just because you're a trainer doesn't mean that you workout all the time at the gym you work in. When I first started, I opted to workout before the gym was open, and I had the gym to myself before the front door was unlocked. It was great because I had no times to wait for people to open up a bench rack or use a set of dumbbells. When I moved to Ohio, I had a similar setup where I could train at the gym I worked at, well before it was open up for private training. It was a private training facility with no memberships, just private sessions lined up for clients and athletes. Once again, it was a nice perk to have a gym to my own without any interruptions. My next job in MN turned out to be a great gym to workout in, however when fitness membership climbed rapidly, I couldn't get in a solid workout without an interruption. I liked to try workouts with set rest periods and such, and I would see those rest periods or super-set routines get interrupted by members often. They didn't realize that I was 'off the clock' and would bother me for some help with a machine or problem in how to operate it right. This would happen so often, I ended up buying my own home equipment and just doing stuff at home. The only workouts I would do would be on a high speed treadmill back at the center. No one would seem to bother me on that one, but with free weights and machines, it was a different story. I also got into kettlebells around that time and when the opportunity rose for me to get into my own private training business, I rented out a racquetball court and once again, had more available time to myself for uninterrupted workouts. When I got out of the training field full-time, I still had my kettlebells and other training devices, so it was pretty easy to still keep doing at-home workouts. Honestly, kettlebells have been with me since I've started with them. What looked like an odd thing to do became a wonderful tool to use for an odd thing like me. :) I loved how they really connected strength & power together with the movements and exercises you can perform with them. I left that side of things when I realized that people were selling used copies for $20-30 and it was harder to sell $120 packages with all that happening. All it took was a cousin or neighbor to have a copy that they didn't want any more and sell it for $25 as a steal. I also needed more control over what I was doing instead of blindly following a program for 90 days. This hit me when my running was affected and my workout time was eaten up by a 60 minute DVD I popped in, especially when I was working two jobs as a custodian and coach. I needed something more ideal and time-saving. That's when Home Workout Revolution was discovered and it hit the target perfectly. It complimented my running schedules and plans, so I could get in some solid track workouts, but also have time for 10-20 minute, total body routines to keep me strong and active. Also, I noticed I could sell it as a straight-up affiliate, no goofy business 'opportunity' to buy into in order to get it for less. Honestly, I didn't like the way Beachbody was setup either, as an 'independent coach' business opportunity. $15/month just to have a site, plus have so much in "PV" points so you feel forced into buying stuff in case you don't sell anything? I was spending almost $70 a month just to have the 'right' to 'sell'. Should've caught onto it earlier. I didn't like that kind of pressure and nature of it after almost 2 years of putting up with it. It went nowhere. One sale. ONE. What an 'opportunity'. When I decided to sell stuff privately as an affiliate, like I do with HWR, I actually made more money on one sale of that, than I did off of any Beachbody sale I made. I've decided the affiliate route is best to sell for at-home fitness programs, its why I chose HWR and Workout Finishers as well, plus Kettlebell Evolution. They already have their own websites to sell the program, I simply lead customers to their links. Works pretty slick, if you ask me. Once I sell it, it's done. Maybe the trainer will send you things through their contact list of customers, but that's it. Enjoy the workouts and don't worry about being harassed to sell others tied to the company. On the supplement side, I went with AdvoCare because of their different makeup as a business opportunity. For me, with Beachbody, you felt pressured into selling the 'business coaching system' as the only way to really sell products to people. I like AdvoCare's setup because you can buy it as a retail customer, or as a Preferred Customer with a low yearly membership that you will easily get back with savings on the products. PC's can also become a Distributor like me if they want to upgrade, really leaving it up to the consumer as to what they want to do. All in all, the at-home workout has always been a go-to option for me. It doesn't keep me away from the regular gym though. I still enjoy lifting heavy and getting in a good workout with a treadmill run or killer barbell/dumbbell routine. The beauty of the at-home workout gym/area at least gives you the option of getting in that workout you desire. It keeps you on track and helps you get closer to what your end result will become. If you want help in going over your at-home fitness plan, get in touch! 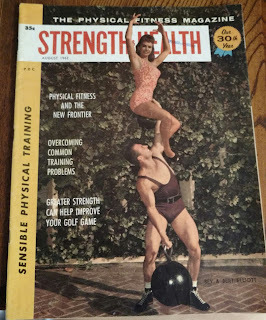 Today's Throwback Thursday post covers an August 1962 Strength & Health article on how to improve your golf game with a pretty serious workout strategy. First of all, as a kettlebell guy, I LOVE this cover! She's resting on top of the kettlebell he's already lifting, Just an impressive feat of strength overall in this picture. Anyway, let's get to the workout! If you had a set of adjustable dumbbells and a bench, you had just enough to get this workout in. Sounds like my kind of workout: minimal equipment and bodyweight work. Here is a photo of most of these exercises. It was suggested to do this routine 3x/week, 1 set per exercise, for a month. After that first month, add another set. Sets could be done in the 10-15 rep range. I shared this with a fitness professional who is very well-known, he was impressed that something like this was even published back at this time. It stood out to me because I have read articles on how dumbbell exercises and kettlebell exercises can be pretty beneficial for today's golfer. Looks like they were onto something in 1962. 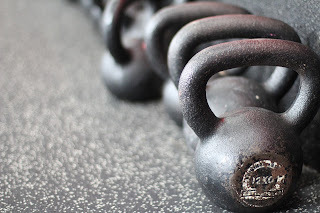 Shortly after I began to train with kettlebells, I noticed a great improvement in my swing and control of it, which I greatly attributed to kettlebell use. I don't golf as often any more, its been years since my last 18 holes. There are no kettlebells here, but some of the lifts could be used with them, such as the Swing of course and perhaps the side bends could be replaced with KB windmills for a more complete core choice of an exercise. When you look back at these magazines, the presence of gyms was just starting to pop up, but a lot of routines were done at home with bare basics. My stack of magazines are littered with ads for lots of home gym weight sets and other apparatuses made for home gym setups. Quite a few were made by the Weider Publishing company and the Strength & Health magazines had a lot of York Barbell products advertised in it. We are almost seeing a renaissance of the home gym once again, this time in the form of 'garage gyms' or some basement gyms that are well setup with squat racks, benches, dumbbell sets, etc. There definitely is a movement to create the ideal home gym right at home for the serious lifter. Even a new company called PRx Performance is specializing in foldaway racks and benches that are ideal for setup in a garage setting or basement setting, targeting the CrossFit enthusiasts out there. Just goes to show you, the more things change, the more they stay the same sometimes! Today's workout was a mix of 2, 4 minute circuits from the HWR series. Later today I'm hitting the gym at the college with my friend, so this morning was a good time to do some brief workout circuits of 4 minutes each. 20s Punisher Squats, with 10s hold after x 3 rounds. 20s Punisher Squats, with 10s hold after x 3 rounds to finish. For more brief workouts to choose from, think of HWR and how it can be used in 2017 for you! Go to http://tinyurl.com/cbhwrevsale to discover the benefits of HWR today. Today's kettlebell attack was reducing the rest between sets of 20 on kettlebell cleans and condensing the 20 minute workout down to 15. 10 reps per side took around 50+ seconds to do, so instead of doing a set every 2 minutes, I went every 1:30. I was able to handle this better than expected and it went pretty good on the first try of the new work/rest pattern. This ended up being 200 cleans, the same as the former 20 minute routine. Work/rest patterns are an easy thing to change when it comes to making workouts a little more challenging, or by lightening up intensity a bit with the same weight being used. 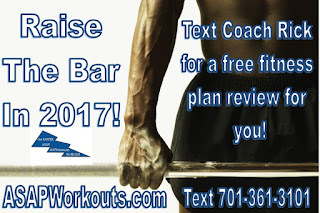 Time has run out on free shipping for the AdvoCare All-In 2017 24DC package, however there are still plenty of other options to try as you begin 2017. I would suggest one of the MNS packs, plus a box of Spark to pair with it. This package retails for under $70 and can be a more affordable option in comparison to the full 24 Day Challenge package. Another popular option is the Lean Life Project, which is the combination of an MNS pack, a box of Spark, plus the new AdvoGreens drink mix. This is just under $100 retail, even less as a Preferred Customer. Talking with another AdvocCare Advisor, the LLP package just needs to be ordered as individual products and can be paired up with others if you like. Ask me about LLP if you are looking for a more affordable package. Find out more here at http://tinyurl.com/asapadvo. Back when I had a training business, I ran a 30 minute boot camp structure that had a 21 minute workout as the core portion of the camp. My tagline of it was "Saving 39 Minutes", meaning you'd get a lot of work done in 21 minutes, versus a 60 minute workout. I've always been in favor of brief workouts that allow you to get in quality reps for each exercise you do, yet condenses time to help you save it overall. Today's HWR workout was no different, as it was 19 minutes long and helping me save a lot of time in the mornings. All I needed was my computer to run the video and my bodyweight to provide the resistance. There was one portion where I used a set of dumbbells for dumbbell rows as a back exercise, but even then, the equipment is very minimal. Now, I'm not against the lengthy workouts if that is the main purpose of them, such as a heavy barbell routine of squats, deadlifts, bench presses, etc. Those exercises are better suited for low reps, heavier weights, and longer rest times for recovery from that level of intensity. I have done the barbell and more traditional bodybuilding routines in the past, however I always seem to turn to the brief, shorter workouts of moderate resistances and higher outputs of reps.
After doing HWR for almost 4 years now, I have turned to this series as a solid resource of workouts to do when I have usually faced short time frames to workout. Some trainers have totally gone away from suggesting traditional cardio, such as regular running and cycling workouts. The two trainers I sell products from, Craig and Mike, they do not shy away from that suggestion at all. However in my experiences, I have seen the HWR workouts as a great compliment to my running/cycling workouts that I have done. I'm a non-typical runner who runs 3-5 times a week, not daily, and who adds in strength/power routines with HWR and kettlebell routines. I don't train for half or full marathon distances, which require more training times and longer distances of course. I find that the workouts blend well within a 5K runner's training plans. If you need a solid workout routine with multiple options (versus just 12 workouts or less of other programs) then HWR is a wise choice. Also, today is the LAST DAY of Free Shipping on the All-In 2017 24 Day Challenge special from AdvoCare. Take advantage of this and save even MORE if you become a Preferred Customer first! Why? A Preferred Customer membership with AdvoCare is $19.95. Once you have that, you will then save 20% off of the 24 Day Challenge cost, which is right around $20 anyway. THEN you will also benefit from the Free Shipping offer, today only is the last day on the Free Shipping Offer! As a Distributor, I save 20% as well and it cost me only $168 total with the free shipping offer. Of course, as a Distributor, I not only get the savings, but I can sell the products too. So, if you want the opportunity to sell the great line of AdvoCare products, I suggest becoming an Independent Distributor with them. As for me, in 2017 I want to make a lot of positive change in my life and others. I want to do it with my full time job as a recruiter and help students discover the great benefits of attending our college. I want to help others as a speed coach in the summer, and I want to help others with fitness programs and products at home with the opportunity from AdvoCare. I like the freedom of working on this part time opportunity on my own time, and also doing it online gives me even more freedom, as the blog and websites help others when I can't help them directly face to face. I have tried having a part time job for 4 hours after my full time job each day and it drove me bonkers. I love the freedom that offering multiple options gives me (HWR, Workout Finishers, AdvoCare products, and private training this summer). To me, I'd rather work on my own schedule and have my evenings open for opportunities when they arrive. The potential for me to earn income is unlimited, not limited by a schedule set by someone else. I can not only sell locally, but to people farther away from me, too. I also want the best out of my health and fitness goals and the 24 Day Challenge is the best option I see in making that happen. I'm happy that AdvoCare offers both opportunities for me. Consider these options today, because Success Starts Here! After doing sets of 20 for every 2 minutes of kettlebell cleans, I made the work sets and rest times a bit more brief and tried a set of 5 per side, 10 total, every minute. 10 took me about 25 seconds to do, so I got around 35 seconds of rest between sets. I did 200 cleans total once again, all with the 53# KB. Timed work sets are easy to setup and you only need a stopwatch to really do it, or use the GymBoss Timer. GymBoss has a free app to help setup work/rest periods. I usually use a small clip-on timer from GymBoss for runs and bike rides, but the timer on the phone works great for at-home workouts. 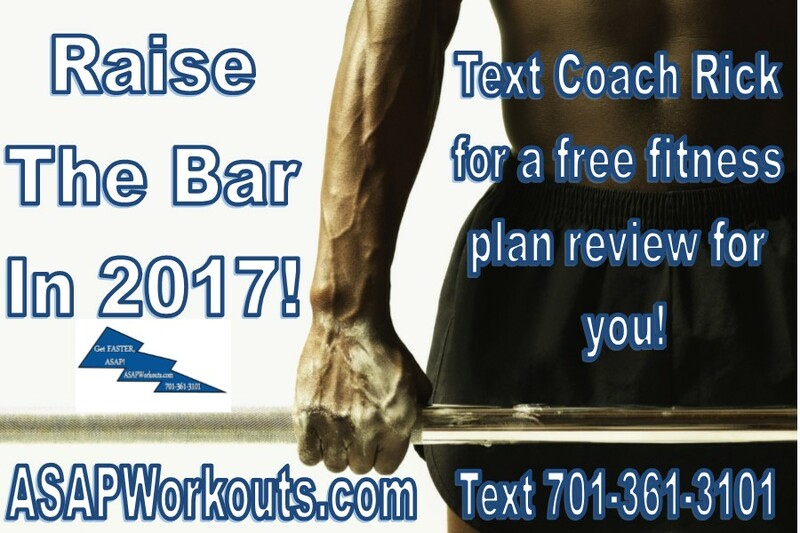 Have you thought about the workout plans that you'll do for 2017? Give Home Workout Revolution a serious look for some total body, no-equipment and minimal equipment workouts that are around 20 minutes and as low as 4 minutes. I suggest doing at least a 10 minute to 15 minute HWR, even a 20 minute one about once a week, then add in the 4 to 6 minute add-ons for core workouts and even mini total body workouts to work as a finisher. It's basically 50+ videos for $47, and you can download them instantly after your purchase: the program is entirely online and there are no DVDs to wait for (unlike other at-home programs out there). Order your complete set of HWR videos and manuals today and even get started on them tonight, so you can get a jump ahead on your fitness goals for 2017! If you already have a plan set aside, consider adding a Workout Finisher plan to your routine. Workout Finishers are a wonderful thing that can be added to ANY workout plan (they work great with HWR, since their creator is featured in the HWR series). Take a good look and see if Workout Finishers are ideal for you! Don't forget, time is running out on FREE SHIPPING for the 24 Day Challenge from AdvoCare! Order it today, and save even more as a Preferred Customer! If you have questions on the 24 Day Challenge, just ask me! We are in a pretty extreme cold snap up here in ND, as temps are in the -20's and wind chills are -30 to -50 below, even down in SD. Needless to say, I have stayed inside most of my weekend. As far as workouts go, I did a kettlebell clean workout, Tabata Style, for 12 minutes. That workout ended up getting 8 cleans per side, switching arms every 30 seconds in the series. I used the 53# kettlebell in the routine and even after 8 minutes, the routine was smoking me. Finished my way through it safely. but it sure was a good condensed workout. Overall it was 192 cleans done in that amount of time. This morning's routine was another HWR one that I discovered as a total bodyweight workout, done in a 30/15 work/rest pattern, with 5 exercises for 5 rounds total. This took around 21 minutes to do. Each round was slightly different in the choices of 5 exercises. It was mostly a squat, a lunge, a push-up variation, a core exercise, then a total body one like a total body extension. This ended up being a very good workout by itself and a good way to start my morning. Typically I will rest on Saturdays but with the cold weather making me feel locked up inside my home, I felt a brief kettlebell workout was in order to break up the day. I spent some more time going over some AdvoCare products and I must say I like the options of the MNS series and how they are split up into packs and when to take them. The more I look at the MNS series, the more I like it as a great choice for people and their goals. It sure makes the process simple, compared to taking stuff from half a dozen bottles or more and wondering what to take all the time. Have you checked my video on it yet? It is on the ASAP Workouts Facebook page. In the video, I also shared a story of meeting a past athlete I coached and trained over 10 years ago, and how it ties into AdvoCare and its avenue of how it gives me an opportunity to still help people out with their goals. AdvoCare has some great opportunities to allow you to help people with health and wellness goals in their lives. I've checked out many companies, have been a part of other ones, and I always ended my run with them because they always seemed to be about selling the business instead of selling the products. AdvoCare to me is about the products first and the opportunity second. When you have the option to be a Preferred Customer and save 20-30% on products for a very small fee, and not be pressured into selling something you may not want to sell, I like that as an option for customers. Not everyone wants to sell things, perhaps it is not their strength, and they simply want to enjoy a product and save money in getting it. However, if you are like me and you really like the products and want to turn a passion of helping others into a great opportunity, other options are there for you to take, such as investing in a Distributor package and getting the right things lined up. Over time, you can grow to be an Advisor (my long term goal to help me get where I want to go). If you are interested in this, I can help you along and show you how I've done it. Many of the things are free to setup, like this blog was free for me, plus Facebook pages are free and simple to setup as support systems in place for this opportunity to grow for you. Maybe just a simple Facebook page is all you need to get things going. Overall, there are many options for you to grow with AdvoCare. This morning was a pretty quick workout, as I had another late night and not much time in the morning to get something in. I went with 300 swings with the 40# kettlebell, with the option to workout tonight as well for perhaps a heavier KB cleans workout. After using the 53# one all week, the 40# KB felt like it was a paperweight in comparison for this workout. This weekend gives me a good opportunity to go over more workout plans and goals and really lay things out for the 24 Day Challenge I'll be starting in January. The more I'm doing work with my kettlebells, I may pop open some KB books I have and see if anything catches my eye on a new exercise or routine to practice. One thing with kettlebell training is that it is a workout where you must incorporate practices as the workout itself, and not have the end goal of just getting torched from a workout with them. Yes, its a great feeling, but over the course of time, you can't physically pound your body into oblivion and expect it to perform. The more I've done KB work, the more I want to get into trying the competitive side of it. It always seems to intrigue me, more and more, as I look at it. I think it would be a nice compliment to my running and allow me to really develop strength and power in an off-season of running, or perhaps do it year-round. Maybe 2017 will be a competitive year for me in the KB lifts? Perhaps the 24 Day Challenge will inspire me to do so! Today, I'm starting a new kind of post for Thursdays, a Throwback Thursday post that covers from classic articles from past fitness and strength training magazines from the 1960's and 70's. If you know me, you know I am into antique store shopping and finding classic stuff. Last year I found a national fitness program that was created in 1962 or 1963 through JFK's council on exercise. This year, I found a nice stack of classic magazines of Mr America, Muscle Builder, and Strength & Health magazines. 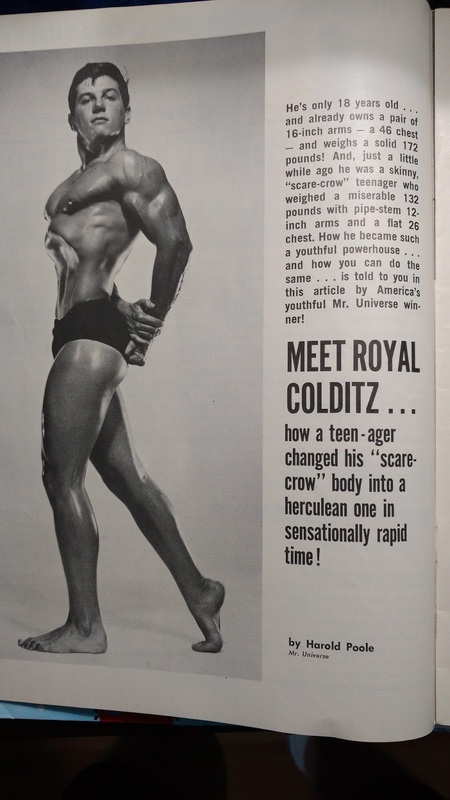 Today's showcase is the Royal Colditz Plan from an April 1964 issue of Mr. America magazine, published by Joe Weider of the famously historic Weider Publishing. 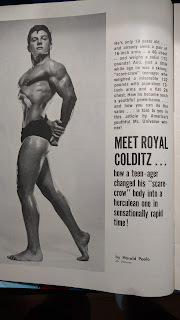 Royal was an 18 year old chiseled rock of a young man, who 'blitzed' his way to his physique by following a pretty serious daily routine. To make a long article short, he had supposedly 1500 pounds of weights plus barbells and dumbbells in his basement and trained with his friends to sculpt his physique. The young man is pretty cut and lean with the work he put in. Of course, using the weights given wouldn't work for everyone and their strength levels, but I think the general take away is that the program is essentially a 3 sets of 8 routine for most exercises, so finding a good 10 rep max to use (70% of a 1 rep max, approximately) would leave a few reps in the tank to finish out all the reps for the exercise. Given the look and structure of this routine, a good bench and set of dumbbells would allow you to do the routine at home fairly easily. Amp up the ab exercises with a stability ball with basic ab crunches and knee tucks, and you have a fully modern twist on this classic routine. If you had a strong enough stability ball, the bench press and chest exercises could be done with dumbbells. The front squats and half squats could be subbed with dumbbells if you don't have a barbell or a stand to use for squats. For a complete newbie, you could try to do 1 set of 8-10 for each exercise given, then try 2 sets of 8 as your next phase of training. I would re-work this program as a daily routine by progressing over a 6 week period with increased sets at first, then increased days. I have never done this, but part of me wonders how long this would end up. I'm guessing 4-5 minutes per exercise with rest between sets and switching exercises, so perhaps 60-75 minutes in the grand total? Part of me wants to give this a shot for a time, just to see if I can get through the entire workout as a challenge. On my own personal workouts, I did 200 KB cleans last night in sets of 20, doing 10 per side and resting about 1 minute between sets. 20 reps took almost 1 minute to do, so I rested until the 2 minute mark came and performed another round of 20, all the way up to 200 in under 20 minutes. It was a nice work/rest ratio of 1:1 and allowed me to get some good quality reps in and to 'practice' the lift and execution of it. This morning I did another 10 minute HWR routine, keeping up with my Sun-Tues-Thurs HWR day pattern. I hope you enjoyed the Throwback Thursday workout from years gone by. I know I really enjoy looking back in the pages of history to see what was done years ago, and seeing how some things are almost better from the past in comparison to the stuff put out today. Last night at the college, I helped out with a fun Finals Week "Breakfast at Night" event that some staff volunteer and help out with. I helped my first time last night, and ended up doing a workout last night in place of my morning one today. I wasn't sure if I'd be up for a quality workout this morning with a short night of sleep, so I opted for a kettlebell cleans workout. The workout started with the 40# one, doing sets of 10 from side to side, up to 100. I rested about 1:30 and tackled the 53# KB for sets of 5, alternating side to side again, up to 50. The final 10 of those 50 attacked my core pretty good, realizing I need to do more than just swings and get in some clean workouts for a good upper body/core targeting. I finished it off with a set of 30, then a set of 20 with the 53# KB again. All in all, it was 100 reps with the 40, 100 reps with the 53. I liked how the 53 felt and how shorter sets over a longer time frame, such as sets of 20 with two sets of 5 per side (5 L, 5R, 5L, 5R) might be more ideal in the next workout. Feels good to take a morning off for a change and I may try another brief workout tonight. Last night, I also talked for a bit about the AdvoCare product Spark on my Facebook page. I brought up the fact that an average pop in today's stores goes between $1.50 and $2 a bottle. If you averaged a pop a day, that's $45 to $60 a month spent on pop. Most of us take it for the sugar rush or caffeine rush we get from it. What is great about Spark is that it comes in handy stick packets which you can shake up in a bottle of water very easily. There is some caffeine in Spark, about half of a cup of coffee. Its also low in sugar with only 4g and 15 calories in all, plus 20 minerals and vitamins. It is a healthier alternative than what we seek when we drink a pop, and guess what? It is also less expensive! Check out what I wrote on my page for ASAP Workouts last night, right here. Spark is a great option instead of buying a carbonated energy drink, which can leave you bloated from the carbonation and jittery too. Consider Spark if you plan to quit or reduce your drinking of pop for your New Year's Resolutions. This morning's routine was set to be an entire bodyweight workout, but I did add some KB swings in the middle of it. I started it off with Total Body Extensions, then push-ups, then Kettlebell Swings for a straight set of 100 within the 3 minute time period of 6 x 20/10. It was finished by mountain climbers and then prisoner squats. It was a great start to the morning and felt like a good mix of bodyweight with a little kettlebell madness thrown in. You can get this workout, plus over 50 more videos to follow along and workout to, with the complete Home Workout Revolution program online. Get started with some HWR workouts now, so you know what to expect when New Year's comes around in just a few weeks! It would be perfect to pair up with the 24 Day Challenge, too. Take a look at the 24DC if you're still undecided on how to start off 2017. Are You All-In for 2017? Are you ready for 2017 yet? I know I can't believe 2016 is days away from being over. However, I am pretty excited every time a new year comes along, since it gives a great opportunity to hit the reset button, if you will. It also creates a solid point of direction for you. A lot of people will choose health and fitness goals as their main resolutions in the New Year. After having been around the fitness field for so long, I know how this goes, too. People come in like a ball of fire for the first week or two, hit a snag, and suddenly quit. I've seen it happen time and time again. No matter where I was at: North Dakota, Ohio, or Minnesota, it happened. People would plunk down a good chunk of money to invest in their training, yet let it go to waste. People will drop hundreds, even thousands on fitness equipment, only to let it sit for months on end. They quit before even giving it a chance. This year, you can avoid that quitting phase and move past a stumbling block. You can join my 24 Day Challenge group online through Facebook and let me coach you through the first month of January. Well, its because I've been one for many years, in both coaching sports and coaching clients of mine when I was a fitness trainer. I have used coaching strategies on both ends and have helped many athletes and clients surpass those inevitable roadblocks and find success. That is why I'm doing the 24 Day Challenge from AdvoCare right along with you! I have my own goals to achieve, and I need the support as well. TEAMS support each other to success, that is why I'm creating my own team online! AdvoCare has a great special going on right now for a limited time. You can get free shipping, plus bonuses like a shaker bottle, meal portion containers and a tape measure too, when you order the special All-In 2017 package. Email me for details, or go to the latest blog posts that talk about the 24 Day Challenge. I can even help you by phone and go through it with you, step by step. I suggest becoming a Preferred Customer first, in order to save even more, compared to the regular retail price alone. Preferred Customer memberships are only $19.95, plus you get a special package to go with it. You also start out at 20% off and can build up to 30% off as a PC member! Once again, contact me for all the details or ask to line up a phone call with me to take you through the steps of ordering the 24 Day Challenge. After the dual workout of total body and kettlebell swings yesterday, I went with a complete kettlebell swing workout today. I was aiming for 400 swings, and after 400 I went with one more set of 100. I rested more time between sets today, doing 100 reps every 3:30 on the clock. This allowed me to get 500 done in under 17 minutes for the total routine. I went heavier again with my heaviest kettlebell, the 53# one. Yesterday I went through the 24 Day Challenge a little more and tried to figure out what to take and when. The MNS packs are pretty straight-forward. You have a daily strip of packs, already separated for you. Then, you take each little package at certain times. There is even an app on your phone for the 24 Day Challenge to help you out! AdvoCare really created a solid package of nutritional steps to take here over the 24 day period. Don't forget your workouts either. AdvoCare also sells their own "Can You 24?" DVD series, with two different levels available to choose from. These options are very affordable too, compared to other systems out there. I plan to pair up my 24DC with the HWR workouts as I'm doing now, plus some kettlebell swing challenges. I've had some of my best results when doing a 10,000 swing challenge in the month of January and also continuing it through February. If you want to be All-In for 2017, please take a look at the 24DC here. Catch the video of me going through my package on Saturday once it arrived, right here. I opted for a change in workout time today and spent some time this afternoon to try some 12 minute Tabata workouts with kettlebells. My first workout was with the 40# kettlebell, doing the following in the 20/10, work/rest format for 8 rounds per 4 minute time period. After this 12 minute round, it was time for a quick break and swig of water. Then, it was followed by 12 minutes of Tabata style, 1 arm swings. I got 12 swings per 20 second set, for 288 as a total. This was done with my 53# kettlebell. Yesterday, I got my AdvoCare package for the 24 Day Challenge. I went live on my ASAP Workouts page and you can see what all comes in the package, right here! I'm pretty excited to start this challenge next month. You still have time to order the 24DC All-In package special. Get in touch with me to help line up your order for some big savings! Today's a good choice for taking a recovery day, there are a lot of activities throughout town today as part of WinterFest. I'm starting mine off with a pancake feed and later with some shopping at a vendor show. I'm spending the rest of the day watching some sports and planning things out for my workouts as well as my plans for AdvoCare & ASAP Workouts. I am doing the All-in 2017 24 Day Challenge in January, so I need to plot out my workout schedule over those 24 days, as well as go over some diet planning along with that. I may or may not get my 24DC package by FedEx today. It should at least get here Monday. Whether or not it gets here, I need to plan regardless. Planning and scheduling is an important part of success. You can join me in part of that planning with the private group I've created on Facebook. Simply ask to join it and I'll add you to the group. Ideally, if you're doing the 24DC, it will be greatly focused on that. However, there is more to a challenge than just taking some nutritional items. Perhaps you want to try the HWR program, or do a 10,000 Swings Challenge in January? There are some other unique challenges to blend in, or do throughout the month of January. HWR is a great fit for those with minimal space, and in need of workouts that can be done in minimal time, too. It is not only an affordable program at just $47, you can also access it immediately after purchase and start downloading the 50+ workout videos. HWR is a great solution for those who don't have time for the gym, or want to maximize their limited time they have. Like I've said, many times, HWR has been a go-to workout option of mine when I am in need of brief workouts and a system I can take with me on the road. Check out HWR today and see how it can fit into our schedule very easily for the 24DC, even right now before January, when life gets busy but you can always find time for a HWR workout! Also think about joining the private Facebook group I've created, you can check it out here! Today's workout didn't have any snow to remove, so it was a full out attack on heavy swings with my heaviest kettlebell, the 53 pound one. In case you're wondering why its 53 pounds, it is built in kilograms as the international standard, so its just between 52 and 53 pounds. Some call it a 52, some call it a 53, some call it a 24 for 24 kg. Most of my KB's are in pounds for their weight. For today's Swings, I did 100 at a time but started up another set every 3 minutes, so I had minimal rest between the sets, right around 15 seconds. I made it through 3 sets but rested another 15 seconds before the final 100. Overall, the complete workout took 12 minutes, a little faster than my previous 14 minute time frame for the same workout and longer rest periods. All in all, another 400 swing workout. I think I'll go back to the slightly longer rest periods next workout. Yesterday, I ordered the 24 Day Challenge from AdvoCare with the special "All-In 2017" package as a part of it. I am getting a special challenge group together on Facebook for some private coaching. Ideally, I would like most of the participants to be doing the 24 Day Challenge along with me. However, if you wanted to join and follow along, you are more than welcome to join. Maybe you want to just try one AdvoCare product for those 24 Days along with your fitness goals. Feel free to join us! Maybe you don't want to try anything at all, but just want some support to get started on your New Year's Resolutions. Join us for that, too! If you're interested in the Private Coaching group, go here and ask me to join it. There is no purchasing required to be a part of this group. Support groups online are a great resource for being held accountable with goals and objectives, and you can chat with others about the struggles and success you experience. Your success can encourage others through the challenge. Consider joining my private group today! Today was another mix of snow shoveling and another HWR session. I went with the 10 minute choice of split shuffles, push ups, lunges, spider man climbs, and bodyweight squats. The snow removal was a quick 10 minute bout and wasn't entirely taxing, so the 10 minute routine felt like a good addition. I was pretty sore after yesterday's shoveling in the morning. Yesterday I also learned more about the All-In 2017 24 Day Challenge from AdvoCare. They have a great special going on right now until Dec 20th, where you get the 24 Day Challenge package with free shipping, and also some free gifts to go with it, such as a shaker bottle, portion packets, and a tape measure too. It is a really great deal if you are a Preferred Customer first, and then order the package. In comparison to just the retail option, PC's will not only get a better deal at 20% off, you're getting the savings in the free shipping, and savings in the future for other products. This is a savings of over $35 when you compare it to the retail only prices. That is a great deal for you. Look at becoming a PC first and go here to do take the first step. Then, once you are a PC, order the All-In 2017 package of items and be prepared to save a good chunk of money with the 20% off and free shipping, too! If you have questions, please call me and I can walk you through it, I'm here to help! I will order mine very soon, as I plan to do the 24 Day Challenge and even have a special private challenge group on Facebook for my customers who do it too! If you want to do this Challenge, email me or contact me on the ASAP Workouts page and I will add you to the group! Even if you aren't sure on the full Challenge, but wanted to try at least one AdvoCare product out in the month of January, I invite you to join my private Challenge group too. Private Challenge groups are a great source for people to stay connected and support each other through a fitness and wellness challenge period. You can see the steps of success that others are taking and also see how others overcome obstacles in their way. If you want to get serious about it in January, ask to join the Challenge group now! Yesterday, we were hit with a big blizzard and everything in ND was pretty much at a halt. I saw one map where about 95% of major roads were closed due to the high gusts (40-50 mph plus) and some continued snowfall. I shoveled first thing in the morning, not knowing what the schedule would be for my work at the college. The college was first delayed to 10am, then later cancelled for the day. I should have went at least once or twice to clear out what drifted over, but on the bright side, it made such a great workout this morning. . Sense my sarcasm? I will probably have to get out once again if the plow comes through, as there is a nice high drift in front of my driveway. I spent over 30 minutes shoveling, making for a heck of a workout on its own. I imagine I have another round or two ahead of me, so I'm saving myself for later. With the whole day off from work, I did spend a lot of time organizing my home and also doing some self-improvement reading by reading Craig Ballantyne's "Perfect Day Formula". I realized I'm not that far from the schedule of it, as I get up each day rather early around 6am, get my workout in first thing (just enjoy that feeling), work on the blog here, then I'm set for the day at work. I typically have time to spend in the evening doing things I enjoy, like taking in sports events or watching my favorite shows (loving all the CW superhero lineups!). A lot of things pertained to business goals and objectives, and having some basic rules to live by. Some see rules as restrictions, but really, they can give you that freedom. The structure they provide gives you a framework of solid decisions to make and adhere to, which keeps you focused and therefore, gives you time for the things in life you need. Craig gave a great personal account of his two different lifestyles, how one was previously a scattered day of activity, while his current time is scheduled and devoted to certain things throughout the day. I try to keep a similar structure to work, as my previous job was one where I had to keep things moving along on a structure, due to classes starting and events happening at certain times of the day within a school. Even though I work at a school now, a college, my job is more office-based and at times, on the time schedules of the schools I visit. I feel the previous work as a custodian and being able to direct certain work during certain times of the day allowed me to get used to the scheduling of school visits in 2-3 different schools within a day. All in all, it was a great read and was only $9.99 on Amazon Kindle. I got it finished at various times throughout the day, maybe spending 90 minutes on it. I also spent some of last night going over my goals and plans on where I want my blog to go and how I will help people with it. If you haven't joined the Facebook page yet, follow it today! Well, we finally got some snow over the evening and it continues today. I spent about 20 minutes shoveling off my driveway, then still had the energy for a total body workout from HWR. I chose the 10 minute option (one of a few to choose from) since I spent time with shoveling 5-6 inches so far. The 10 Minute HWR was a good little conditioner, with running in place, Spider-Man Climbing Pushups, Switch Lunges, Burpees, and jumping jacks. It was a great little add-on after the snow shoveling was done. I spent some time foam rolling my legs and back last night, which really helped in loosening up some sore muscles from Sunday's routine and Monday's heavy kettlebell swing workout. I have found foam rollers and massage roller sticks are essential tools for warming up and loosening up tight muscles before exercise, as well as after workouts. Foam rolling can be a bit tricky, as it hurts a little over some sore areas, and there really is no certain amount of time to roll across those areas. A common tip is to roll and hold for a few seconds in certain tight areas to release the tension, then roll gently some more and move to another area. As a rule of thumb, I generally keep rolling until it feels better and more blood is rushed to the area, holding it in certain tight spots and then rolling some more once I feel it loosen up. If you don't have a roller, a cheap alternative is a wooden rolling pin... yes, this works well too and most are the same size of other expensive rollers. I would use them with track kids and larger groups. My track and XC runners would swear by the sticks and rollers and always ask for them. If I ever coached you, you knew I always tended to have a stick in my backpack for an athlete to use. If you want to learn more about massage rollers, foam rollers, and more fitness tips, ask me to come do a fitness workshop for your workplace or group of friends you workout with. Message me through my new ASAP Workouts page on Facebook! AdvoCare Update: I still have some info packs of a catalog, DVD, 24 Day Challenge brochure and a sample of Spark to give out. Message me at the ASAP Workouts Facebook page and I can send you one. I only have 5 left at the moment, so let me know ASAP! Today I went out of the comfy zone of using a 40# kettlebell for higher reps and went with the 52# kettlebell for a new change. I did reps of 100 (10 per arm, switching every 10), every 3:30 of time. I concluded after 400 total reps done in under 14 minutes of time. Reps of 100 in a stretch felt like the best to do with the added weight I've been used to. The body was a bit sore from yesterday's Gauntlet workout of HWR. The way it sounds, I may have a snow shoveling workout tomorrow morning. Apparently a snow storm is coming later today and into tomorrow. In other news, I started up a new Facebook page to promote my blog and other programs here. The new Facebook page is ASAP Workouts and it even has a new video on it already. If you live locally, I am offering fitness workshops and speed clinics, plus if you want an AdvoCare pack of information from me, ask me as I have a few left to give out. The fitness workshops can be free or used as a fundraiser for your club/organization. Speed Clinics can be run the same way as a fundraiser, with a small percentage split (20% for me, 80% for your club) to help cover materials for me. Get in touch if you want a workshop/clinic scheduled in the future! It's back to another week of HWR workouts again. I'm trying something new in starting my workout 'week' on a Sunday instead of the typical Monday. I've traditionally started new programs on a Monday, however I am liking how it feels that I've already got a jumpstart on a program when Monday rolls around. Today's routine was another HWR one called The Gauntlet. It was 3 rounds of pairing up 2 exercises as a 'sandwich' of sorts. The first exercise was lunge jumps with Spider-Man pushups in the middle with another set of lunge jumps. Then it went to Total Body Extensions for 6 rounds, Decline Pushups (feet on the couch for me) for 4 rounds, then another 6 rounds of TBE's. That workout was pretty intense, with the switching of exercises in a sandwich format. Your lower body really gets it on this one. Yesterday of course was a rest and recovery day for me. I also spent time on a workshop webinar online for AdvoCare and there is a great opportunity coming up with that, just in time for the New Year's rush of goal setting and fitness programs really being focused on again. I can't express enough how simple it is though to stick with a fitness regimen throughout the holiday stretch between Thanksgiving, Christmas and New Year's. Programs like HWR can be a great solution for keeping on track and finding quality time for quality workouts with minimal equipment. For half the cost of a good pair of shoes, you can get 50+ videos to download and/or watch right away. Take a look at HWR for your fitness plans to get started ASAP with it. It is also a great time to become a Preferred Customer with AdvoCare, which gets you 20-30% off AdvoCare products, ready to save, just in time for the new package that they are offering soon. Go to AdvoCare now and register as a Preferred Customer...it is like getting a membership to a wholesale store and enjoying the savings as an exclusive member. Today I had plenty of time this morning to workout if I wanted to. However, I also know the importance of rest & recovery days, too, after being a trainer and also a coach in various roles since college. Sometimes if you fall in the habit of exercise and you tend to over-do it, doing too much exercise too often and hard workouts in succession, its not a good recipe in the long run. I've seen it happen in athletes, clients, and yes, it has even happened to myself from time to time. As I'm getting older, I realize I'm knocking on the door of 40 and I'm no longer 20, which means I also have 20 more years of the rigors of running, lifting, cycling, and more on my body than I did when I was 20, too. Let's say I did an average of 5 workouts a week. That's 250+ workouts a year, x 20 years = 5000 workouts!... and a lot to recover from, each week, month, and year in succession. This really hit me during the summer, when an Achilles tendon injury kept me from enjoying a summer of running races here and there. It took me weeks to get back into a pattern of consistent running, even if it meant backing down to 2-3 runs a week just to help my tendon recover better. It meant saying no to speed workouts for the summer, and focusing just on slow and steady efforts with occasional bursts of speed to change up the pace. Keep recovery days in mind if you feel your body hurting more and more in places you haven't had any bothersome issues. It is perfectly fine to alternate high intensity and lower intensity/volume workouts. Science has shown us in the fitness and sports performance worlds that alternating these variables is essential for long term success. I feel its why I had some issues with prior training programs, such as P90X or Insanity, as even the 'recovery' days felt like too much at times and I may have been better off with a long/slow bike ride. That was a trick I had to learn one summer, where I basically cross-trained hard speed workouts on the track with long rides in-between those days. It wasn't 3 hard speed workouts a week, but 2 spaced-out ones on the weekly schedule (like a Tues/Fri) mixed with longer rides or easy runs in-between. Recovery days are great for getting in a solid rest from working out. What seems like one day off, ends up being 2 in terms of hours. For example, my last workout was Friday morning around 6am. If I take Saturday off and don't do another routine until Sunday, I will actually have 48 hours of rest between workout times. Out of that 48, you'll have 14-16 of those hours at rest in the form of sleep, which is where your body really makes the changes. So, take that "day off'' now and then and give yourself a possible 2 days of full rest as a result! It was another KB Swings workout today, hitting another 600 swings in 18 minutes. It is a good way to finish out a workout week on Friday. Last night I made a short video on Facebook Live to discuss the blog and also talk a bit about AdvoCare. You hear in my own words a little about the workout programs I sell, like HWR, as well as a little history on having blogs in the past after my training career was over, and how I still dabble in the hobbies of it with ASAP Workouts and Climb The Podium Events. I offered a free package of items from AdvoCare for those who are interested. Comment on the video that you'd like one, then we can message each other privately for an address if you live far away. If you live close by, I'll make arrangements with you to deliver it face to face. AdvoCare is unique in how you don't have to become an Independent Distributor in order to get discounts. You can become a preferred customer and save 20% for a cost of under $20/year. This morning's routine was the 12 minute HWR circuit. The regular circuit is jumping jacks, close grip push ups, bodyweight squats, mountain climbers, and prisoner lunges. My twist was this: standing ab twists, push-ups, KB 1 arm swings, mountain climbers, KB 1 arm swings to finish. The amount of cycles for each was 2 minutes of 20/10, 2 minutes, 4 minutes, 2 minutes, then 2 minutes. I can get 12 swings in during a 20s work period. For my final 2 minutes, I went entirely for the 2 minute period for 72 swings total. Last night, I tried something new with my full time job at the college and did a Live Admissions Chat over Facebook. I had to break out of my comfort zone a bit, and by the end of it, I had a lot of fun doing it. Today, I should get some material in from AdvoCare, so I am thinking of doing the same thing with going Live on Facebook to help promote the products and tell you about them. I may go Live tonight on my personal page, or sometime this weekend, to talk about AdvoCare and the opportunities to be just a regular customer, a Preferred Customer, a Distributor like I am, or advance to Advisor (which is a goal of mine). If you haven't checked out AdvoCare yet, I invite you to visit the page here, or click on the logo above and check out the 24 Day Challenge they have. Today was a day to tackle more kettlebell swings. I've had a lot of success in the past with doing KB swings as a stand-alone workout. I've had some momentum with my diet and exercise this week, and swings were a good decision to keep it going. I used the 40# kettlebell and did 200 per set, switching hands every 10 reps throughout. This takes me around 5:30 to do, so I will rest 30 seconds and hit another 200 reps in the next set, then another200 after the 12 minute mark. It was 600 reps total. This works out well with watching a 22 minute show on Netflix, so maybe you want kill two birds with one stone and knock out another episode as you knock out a workout. If you want to see how a Swings challenge went for me, check out "Just Swing It!" in my Kindle guides here. I've also started a new email newsletter to go with the blog, sign up for it here on this site at the top of the page, or go here instantly. Tomorrow will be another strength circuit, so the rest of the day is focused on keeping the diet in check and moving forward. This morning, I tackled one of the longer workouts in the HWR series, the 19 minute one. With my tendon issue on my left leg, I opted for DB Squats for the first exercise, then did mountain climbers in place of the jumping jacks. I should be able to start some light jumping exercises soon. Taking time off from running has helped that heal up. I know I don't do planks enough, so that always seems to get me. This workout was pretty tough, mainly because I did DB Squats for 2 rounds of 4 minutes each throughout the workout. Take a look at HWR if you need some quick, simple to do workouts with minimal equipment. Yesterday, I ordered some stuff from Advocare and will have some catalogs to share soon. Did you know that you can sign up as a Preferred Customer for only $19.99 a year and get 20% off the retail price? You can even save up to 30% with the Preferred Customer program. Consider this when you are pondering how to keep away the holiday weight gains and prepare for the New Year. This holiday period of parties and gatherings are nothing more than just some additions to your regular hectic calendar, so don't give up on fitness and healthy choices to make on nutrition. You can keep things in check with a solid nutrition strategy. You can make Advocare a part of that strategy. Take a look at becoming a Preferred Customer today right here. It's a fresh week ahead for all of us. After Friday and Saturday off, I did a workout on Sunday night, plus a KB Swings workout this morning. Last night's workout was a nice circuit of 6 exercises from The Achievable Body program, done in a 4 round circuit in a little over 16 minutes. Since I didn't have a box to jump up on, I did a substitute exercise of Total Body Extensions (a highly underrated exercise) for the time duration of the 6 box jumps on the video. It was a great little workout to do after a 4 day holiday stretch and 2 days off from working out. The Achievable Body's best part of their package is in their diet plan. Take a good look at it and consider if you want a simple to follow, real-food program with minimal shakes and stuff. See why "Vegetables on Friday's are Stupid" and plenty of more wisdom at http://tinyurl.com/wscab . This morning was a return to KB swings, doing 200 in about 5:30, resting for 30 seconds, and doing another 200 in that fashion for 600 total in the end. I basically do 200 every 6 minutes. I switch hands after every 10 reps. I use a 40# KB for this and after a couple workouts, I will probably go up in weight and reduce the total reps, progressively building up again. I've had a long history of doing swings as a stand alone workout, so don't jump right into the high volume that I did. Everyone varies with their ability to handle the exercise as well as what size of KB you first use. I remember starting with 20 to 25# KB's and thinking they were smoking me. Now a 40# one feels about right. For some KB swing workouts, check out my guides at http://tinyurl.com/rkofp on Amazon Kindle. Today, I started it off with a metabolic workout circuit from the HWR series. I know a good strength circuit is good to do before days like today, when you have a big meal and you're probably going to eat a lot more than usual. Strength circuits boost up your post-workout levels, making you burn more calories after a workout is complete, therefore 'digging more of a hole' for you to fill. I might get in a couple workouts over the weekend as I head down to see my family from now through Sunday. Simply take my laptop and pick a video to do. Pretty simple options there. It is another awesome option of HWR, and you don't have to wait after you order it, it can all be downloaded, video by video, instantly once your purchase is made. That means no waiting for DVD's to arrive, or books to come in that go with it, all the materials can be downloaded. The holidays are an easy time to grab excuses out of thin air and that keeps you from working out. "I don't have the time." is the biggest one I would hear as a trainer. That's why I offered 30 minutes or less workouts. Well, these are 10-20 minutes in length, with 4-6 minute add-on workouts if you wish. HWR simply makes it easier for you to FIND THE TIME to workout. Well, its icy/snowy out here now up in ND, and even though we were treated to some rare 50 to 60 degree days for the first half of this month, its now starting to feel more like November again. This is why I bought an indoor bike a few years back, so I had a good cardio option and I could enjoy my cycling at least inside during the winter. My regular agenda with my bike inside is to catch a 22 minute show on Netflix and cycle away. One nice thing I can do right after my workout is to add a Workout Finisher. Workout Finishers are small add-ons to your routine, and can be added to any strength or cardio workout. I even used to add them to basketball practices in the form of speed/agility efforts at the end of practice. A great resource for WF's is from Mike Whitfield, who has designed many WF's to choose from and add to the end of your workouts. Most of these are 2, 3, or up to 6 minutes long. A lot of times I will take this concept and add it to the end of a HWR circuit or bike ride. Mike used these as a trainer himself to help lose 105 pounds on his journey. His story is really amazing and his Achievable Body plan is something to look at as well. Check out Workout Finishers here. The Achievable Body plan is here to view as well. I've been following the TAB diet plan this week and already seeing good weight loss after 3 solid days. Check these two programs out for an affordable solution in your fitness goals! This morning, I attacked the 12 minute HWR workout with a slight modification to it. HWR follows the 20/10 work/rest pattern for 4, 6 or 8 rounds per exercise. I replaced the lunges with 4 more rounds of Mountain Climbers. I've been a big fan of the 20/10 work/rest pattern ever since I came across it around 2000 in a fitness magazine and learned more about the "Tabata Method". Since then, numerous fitness experts have taken 20/10 and either used it wisely or went overboard with it. I have applied it to running workouts for speed efforts and also with strength routines. Craig Ballantyne's system with HWR is about the best I've come across when it comes to using this format sensibly and in a concise manner, and he does it completely with bodyweight movements, meaning you don't need equipment right away to do this. If you wanted to add weights or resistance bands later, you are free to do that. I've done it with kettlebells, dumbbells and other exercise tools like push-up handles and stability balls. For only $47, you can get yourself over 50 videos and plenty of workout/diet downloads to go with it, and get it instantly - no shipping, like other programs you may order elsewhere for a lot more money - and start tonight with the workouts. Give Home Workout Revolution a try if you are looking for a great, inclusive training program that uses your time wisely. Visit http://tinyurl.com/cbhwrevsale today. Wow, what a crazy summer and fall it was for me. Summer was a hard time to get through, as I experienced a major loss in my life and tried to stay active through it all. I started lifting again in the new weight room at the college, but soon fell out of the habit of it due to school starting and beginning a running club for the college. I still kept up with cycling a lot outside and went around 200+ miles per month in July and August. Then, I went on the road for my job and ended up doing a lot of indoor workouts with an occasional run outside. Running was an entirely different beast this summer. I had a bothersome and flared up Achilles tendon that I dealt with all summer and even into the fall. I have been slowly returning to 3-4 runs a week now during the last weeks of October and first half of November. My 'go-to' routines for indoor and on-the-road workouts have been the Home Workout Revolution series from Craig Ballantyne. HWR workouts are 20 minutes or less and very focused to do a fair amount of work in those small times. I have them on my computer and they are a quick thing to pull up in the morning when I'm on the road. Even if I feel up for a brief, 4-6 minute workout in the evening, there are a separate series of workouts designed just for that need, or for a little extra that you have in the tank for your main workout. My schedule usually jumps around all the time in the winter, due to basketball games I go to and take in as a fan. I love the local college games, especially since I work at a college. This typically means that my mornings are set aside for my workout time. Right now, I'm alternating a HWR workout for 3x/week, then a morning run or an indoor bike workout on the days in-between. My workout setup is in my living room, with a bike off to the side, and a mix of dumbbells and a kettlebell or two. Even though I used to workout in gyms as a trainer, there is something I just love about at-home workouts, and its because the workout is right there for you. No time to travel, get to the gym, wait for a spot to open on a treadmill or bike or a power rack to use. Your weights are there, your equipment is right there, your bike is right there. Everything is THERE and no one to bug you. There are some key advantages to working out at home when you consider time management issues. Part of me dislikes the guessing game though of who is going to be there or not (will it be busy, or scarce, or somewhere in between?) Your workout space is as busy as you make it to be. Anyway, I will be able to get more into a routine without being on the road so much, and develop a solid plan of action for my workouts and my diet. I'm going to be doing a hybrid routine of my own indoor bike, some HWR workouts, and the diet program from The Achievable Body. With TAB's diet plan, I was able to drop a good portion of weight before my wedding and liked how I felt after it. I feel I had a terrible diet over the course of my travel schedule for work, so now its time to get that back on track. I also may start using some Advocare products along with this. I have some other stuff to use up before I get some new Advocare products though. I plan to update the blog along my journey, so feel free to follow along. Since I no longer do fitness training, I am now into selling those programs as an affiliate. With the HWR and TAB programs, I sell them straight up as an affiliate. Advocare products I also sell as a distributor. Links for all these programs and others can be found at the top under each tab. This blog is my avenue to discuss my experiences with all of them, and let you be a judge as well. Overall, this blog is to help people who are looking for solutions. These are the ones I see as being a great fit for many!